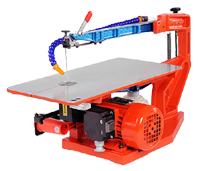 High quality scrollsaws, now at an even more affordable price. The Hegner scrollsaw range provides the highest quality, highest precision machinery in the scrollsaw market. Renowned for impeccable workmanship, Hegner scrollsaws have been designed to last, so whether you're a business, a keen hobbyist, or an education provider, our scrollsaws give you the confidence you need to be sure that your equipment won't let you down.